Oh, how I wish I had that camera set-up on my trip to San Fransisco when I was fairly newly diagnosed. I was using a manual chair, and my best friend was pushing me - even to the top of Nob Hill! Getting a chair's eye view of people's reactions to us would have been dear, indeed. One thing about SF in 1983 was that there were curb cuts everywhere, but we didn't see one other person in a wheelchair in the ten days we were there. Alas. Thanks for the info Marc. Can't wait to get my set up done and start the videos. Wow 8.5mph thats movin but I can see why you need it getting across those streets in NYC you got to move quick. Thanks again hope you are feeling as well as you can. Nice camera setup Marc! I hope to do some local vid-ing when I can. Looking forward to your Central Park vid. Thank you for sharing. I think I'm going to have to do this myself. My husband is a commercial photographer and videographer and he has a couple of the tripods you use. He thinks they are the best thing since sliced bread. If you ever check out B&H Photo, they have a VholdR wearable helmet camcorder for $279 (protection and shooting at the same time) and a Motorsports HERO Wide - the world's smallest wireless on-board video camera that has a 170 degree wide angle lens. It's $179. Could be fun. I can't wait for your next video. It's time to show off how beautiful Central Park is in the spring. That's a great set up you have! Nice wheelchair too. Great set-up Marc. It's good to see it instead of described. I can see the importance of the tripod head now. You've got to love that tilt-in-space function. All wheelchairs should have them. I've had my eye on a Permobil if I have to move from scooter to wheelchair, but this one looks pretty nice and like it can also handle some difficult outdoor terrain. I've directed some people to your videos to show what a ride in a wheelchair is like (a good scooter serves the same purpose), as well as what awful curb cuts are like. Since I haven't learned to recognize people by their rear ends yet, I have a hard time recognizing people I should know. Wow, thanks for the terrific videos--I laughed and cried. Can't imagine how difficult it must be to not have adequate curb cuts. Thankfully for me, that's not normally much of a problem here in Las Vegas. 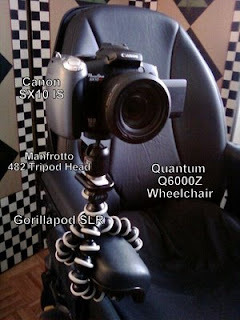 I liked the gorillapod idea for a camera mount! I'll have to try your ideas out in my 21st Century Bounder. I work with service dogs and need the fastest chair I can get in order to adequately exercise the dogs. Though there is now a slightly faster Bounder model, mine goes about 11 mph on the flat. I wish it went 20mph. Why are people with disabilities not able to get faster chairs? I want to rise up and screech, "Conspiracy Theory!" I mean, if we want to kill ourselves hitting a pothole, isn't that our right? No company puts governors in cars so people can't go over 75mph. So why are wheelers treated like they have no brain in which to make a choice? Why are kids scooters so much faster and so much cheaper? Why does my $15,000 chair only go 11 mph when my next door neighbor's $12,000 car can hit 120mph? Great videos, Kamikaze! I'll be back to watch more. Keep on rolling and keep pushing for those curb cuts! Glad to see another wheeler driving in the road as necessary to get moving at a decent clip. Nothing worse than getting stuck behind some able-bodied person's slow moving body. And let's hear it for those who DO clean up after their dogs! Nothing worse than dragging home recycled kibble on my tires. This is awesome! My husband came across your site this morning. My son is 11 with Duchennes Muscular Dystrophy and has been interested in taking photos lately. He likes video too a lot too. We were thinking about the Gorilla pods already then saw your site. We are getting him a smaller camera for Christmas but he also has a heavier one so this would work for both! Thinking about also getting a plug in remote since he has weak arms and cant get them up very high to push the button. Anyway... have a great day! Hello Mark, You inspired me to make videos myself. I tried the tripod first, but the videos were too wobbly (is that the right word?). Now I have a fixed mount and the videos are more stable. You can see some on my you-tube. http://www.youtube.com/user/peterbrandsma?feature=mhee. I have a simple videocam, maybe the images are better with a more expensive one. Hi, sorry for the delayed response, I just checked my pending comments page. 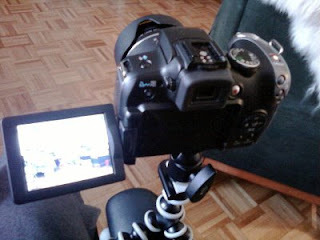 I upgraded to a heavier, interchangeable lens camera (Panasonic GH2) and therefore upgraded the tripod to a Gorillapod Pro. It does hold the camera very securely, although it does transmit a lot of the shocks from hitting bumps in the road directly into the camera. Therefore, when taking stills, I usually only mount the camera when I'm in definite picture taking mode, or on a relatively smooth surface.